WASP-12b, discovered in 2008, is a real outlier among the 400 or so exoplanets discovered to date. Not that it’s particularly massive (it’s a gas giant, not unlike Jupiter), nor that its homesun (host star) is particularly unusual (it’s rather similar to our own Sun), but it orbits very close to its homesun, and is considerably larger than any other gas giant discovered to date. Results from recent research explain why WASP-12b is so unusual; we’re watching it die a painful death at the hands of its homesun, which is snacking on it. “This is the first time that astronomers are witnessing the ongoing disruption and death march of a planet,” says UC Santa Cruz professor Douglas N.C. Lin. Lin is a co-author of the new study and the founding director of the Kavli Institute for Astronomy and Astrophysics (KIAA) at Peking University, which was deeply involved with the research. 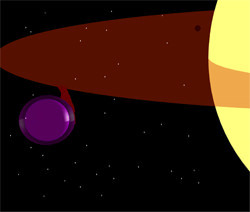 WASP-12b, like most known exoplanets discovered to date, is large and gaseous, resembling Jupiter and Saturn; however, unlike Jupiter, Saturn, or most other exoplanets, it orbits its homesun at extremely close range – 75 times closer than the Earth is to the Sun, or just over 1.5 million km. It is also larger than astrophysical models predict. Its mass is estimated to be almost 50% larger than Jupiter’s and it is 80% larger, giving it six times Jupiter’s volume. 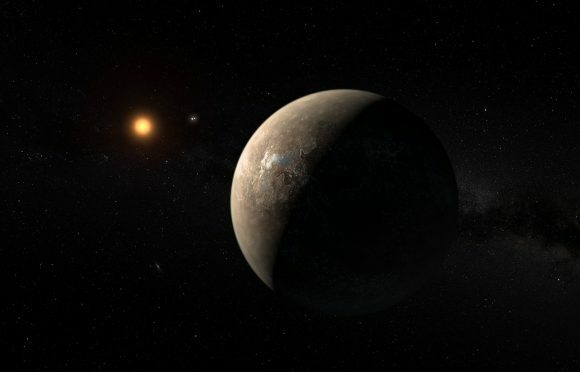 It is also unusually toasty, with a daytime temperature of more than 2500° C.
Some mechanism must be responsible for expanding this planet to such an unexpected size, say the researchers. They have focused their analysis on tidal forces, which they say are strong enough to produce the effects observed on WASP-12b. On Earth, tidal forces between the Earth and the Moon cause local sea levels rise and fall, modestly, twice a day. WASP-12b, however, is so close to its homesun that the gravitational forces are enormous. The tremendous tidal forces acting on the planet completely change the shape of the planet into something similar to that of a rugby or American football. These tides not only distort the shape of WASP-12b. By continuously deforming the planet, they also create friction in its interior. The friction produces heat, which causes the planet to expand. “This is the first time that there is direct evidence that internal heating (or ‘tidal heating’) is responsible for puffing up the planet to its current size,” says Lin. About this image: The massive gas giant WASP-12b is shown in purple with the transparent region representing its atmosphere. The gas giant planet’s orbit is somewhat non-circular. This indicates that there is probably an unseen lower mass planet in the system, shown in brown, that is perturbing the larger planet’s orbit. Mass from the gas giant’s atmosphere is pulled off and forms a disk around the star, shown in red. The disk of planetary material and the embedded super-Earth should be detectable with currently available telescope facilities. Their properties can be used to further constrain the history and fate of the mysterious planet WASP-12b. In addition to KIAA, support for the WASP-12b research came from NASA, the Jet Propulsion Laboratory, and the National Science Foundation. Along with Li and Lin, co-authors include UC Santa Cruz professor Jonathan Fortney and Neil Miller, a graduate student at the university. Source: KIAA; the paper published in the February 25 issue of Nature is “WASP-12b as a prolate, inflated and disrupting planet from tidal dissipation” (arXiv:1002.4608 is the preprint). Planet hunters have detected an extrasolar planet that is only four times the mass of Earth, making it the second smallest exoplanet ever discovered. Astronomers using the 10-meter Keck I telescope at the Keck Observatory in Hawaii found the un-poetically named HD156668b, which has a mass of roughly 4.15 Earth masses. It orbits its parent star in just over four days and is located roughly 80 light years from Earth in the direction of the constellation Hercules. This adds to the growing list of so-called “Super-Earths” now being found. The researchers used the radial velocity or wobble method, using Keck’s High Resolution Echelle Spectrograph, or HIRES instrument, to spread light collected from the telescope into its component wavelengths or colors. When the planet orbits around the back of the parent star, its gravity pulls slightly on the star causing the star’s spectrum to shift toward redder wavelengths. When the planet orbits in front of the star, it pulls the star in the other direction. The star’s spectrum shifts toward bluer wavelengths. 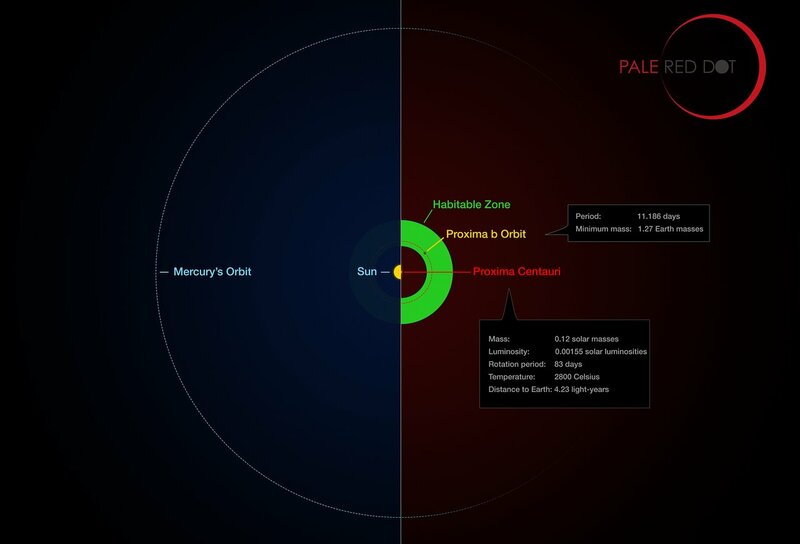 The goal of the Eta-Earth Survey for Low Mass Planets, which was the brainchild of fellow planet hunter Geoff Marcy, also from UCB, to find these super-Earths. So far the survey has discovered two near-Earth-mass planets with more are on the way, Howard said. Other collaborators included , Debra Fischer of Yale University, John Johnson of the California of Institute of Technology and Jason Wright of Penn State University. The discovery was announced at the 215th American Astronomical Society meeting in Washington D.C.